These are things that I'm pretty comfortable with him using by himself. He has to do all writing at the table. He spreads out his stuff and works and works! Some days he sticks the whole alphabet on his body in stickers but most of the time, he keeps to the page! This is a precursor to a writer's workshop where one day he'll be able to create drawings and then sentences and even one day full stories all by himself. It's never to early to set up a writer's workshop in your home. I started with just plain paper and crayons and I've gradually added to his drawer. Do you have a writing space in your home? What kinds of things would you add to my space? I'm linking this up to We Play at Childhood 101. I believe the best learning will occur when Logan is encouraged to play with his writing supplies instead of doing formal lessons. 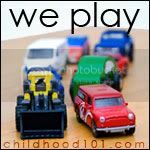 Childhood 101 provides a weekly link up of AWESOME play based activities. Check it out. Alex decided to use his dump truck chair in the basement for his writer's workshop. I mean, he drew and wrote his name all over the chair. It is a really nice chair and I was going to give it to your boys when mine outgrew it! I guess I should be happy he is practicing his writing and expressing himself, right? I recently made a writing box for B with similar items in it (post scheduled soon) and he really enjoys it. Recently he seems to be into writing one thing on a piece of paper and then ripping it out or cutting things in half. I'm finding pieces of paper EVERYWHERE (ahhhhhhhhhh). Do you think I should just let this phase run its course or do you think I should try to steer him in the direction of "writing" more on each piece? We have drawing/writing basket which I try to keep well stocked with similar items, though the three big kids in our house seem to use the stuff as quick as I re-stock! Thank you for this, Jackie! I am not an organized mama in too many ways. William loves using a paintbrush, though. He has discovered watercolors, and when he paints something, we work together to decide what it looks like. I hope to implement some of these ideas very soon! I'm not a montessori expert (but you probably know one online that could steer you) I will say one thing I love about montesssori approach is that they have very defined workspaces and they focus on teaching the child how to use materials appropriately while still encouraging participation. Is there a way you could better define the space that he writes in? Sounds like a fantastic writing set up.